Lara Kail recently joined the DWRT this year and is another strong runner who Boston Qualified in a HUGE way during the marathon on Sunday. If you’ve witnessed her training with the team, she’s very focused and gets results! 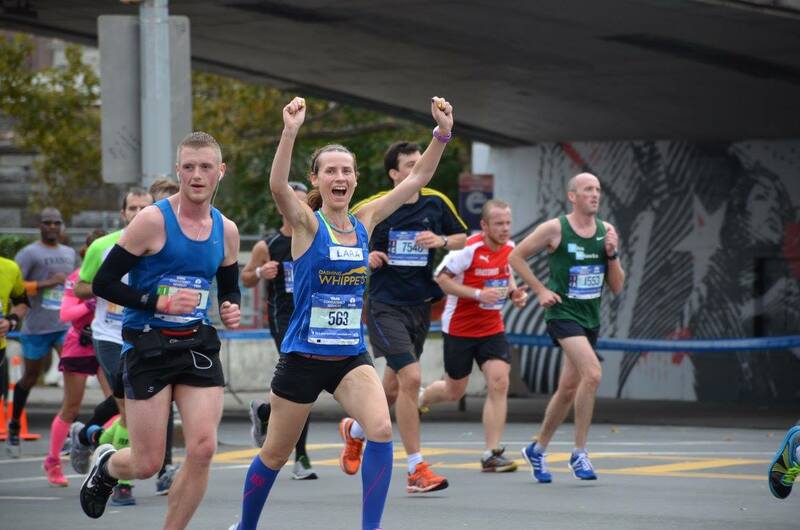 This is the recap of her NYC Marathon Experience. But as it turned out, marathon training with the Whippets—who I joined back in May—really agreed with me. Tempo Tuesdays and long run Saturdays were highlights of my week. Though it took me a little longer to build my mileage (I pretty much spent July “catching up”), once I got there, I was surprising myself each week with how well I was handling it—months of incorporating cross-training (and keeping in one day a week, even during the highest mileage weeks) left me so much stronger going into marathon training than I have ever been. 7:45-8:00 pace was feeling comfortable when we did marathon-pace workouts—even on those warmer days (since Tuesdays always seemed to be the hottest day of the week!) So ok, maybe up the ante to 3:25-3:30? However, I did hit a rough patch in September, with a couple of long runs that didn’t go as well as I would have liked. My confidence especially took a hit after the Metric Marathon. While I really liked the run itself, I was very frustrated with myself with not being able to hit the pace I wanted. Thankfully, Chris Forti was such a huge help and saving grace when I hit this rough spot in my training, especially with getting me through those last few crucial weeks. Then came my big tune-up race at Grete’s Great Gallop half-my goal was to get a PR of sub-1:37, dreaming of a sub-1:34-basically, run a time that would comfortably predict a sub-3:30. Having kept racing to a minimum during this cycle since my focus was getting in the weekly mileage, long runs and key pace workouts, I was anxious to race a long race and see what I had in me. I shocked myself that day with a 1:30:24. I knew racing in 50-something degree weather after the summer we had would make a difference… but really, that much? Which planted the seed in my head-sub 3:20… may be scary, but could that be doable? I tried on 7:30 pace for all remaining marathon pace workouts in this cycle and it felt good… good enough so that if the weather gods cooperated on November 1st, I was going to go for it. But time-wise, this was going to be the first marathon where I didn’t have a concrete number in mind. No sub-4, sub-3:45, sub-3:35, etc. I deemed the goal was going to be between 3:15 and 3:20… and honestly didn’t know whether I’d be on the high or low end of that range-or if I was going to fall completely short. It was truly gonna be where the day took me. Race day. Though this would be my 4th New York City Marathon, it felt like a brand new day for me. Something was in the air. Something good was gonna happen, I could feel it. I was actually awake before my 4AM alarm-all 3 of them, in fact 🙂 Thank you Daylight Savings and one extra hour of sleep? It was fine, meant more time to to do final prep, listen to my “marathon morning” playlist, stretch, eat, do whatever else and not feel rushed. MTA be damned, I actually made it to the ferry with time to spare (thank you, N/R trains for helping us west side marathoners! You are now my favorites), and even got on the 6 AM ferry instead of my planned 6:15 one. I mean… why not? Always better to get to Fort Wadsworth a little earlier and zone out, rather than sit in the ferry terminal on the Manhattan side and stress. The ferry trip and bus ride were surprisingly smooth and stress-free, time went by quickly as I was chatting it up with a couple of women who were running their first NYCMs! By the time we parted ways at our respective start villages and wished each other luck, it felt like I was saying goodbye to old friends. Before we knew it, it was past 9 AM and we got to head out onto the bridge. Once the LC’ers were in position, the rest of the green start followed suit, and we spotted Tom, Jeremy and a couple others who were in the first corral of green and waved them over to join us. We also saw some of our ladies who were on top of the bridge in the sub-elite start yelling and waving to us!! Not even a half hour to go and the excitement amongst our group was sky-high. Although the DJ seemed to have a limited selection of songs to play, I will say I’ll never be able to hear “I Lived” again without it bringing me back to the anticipation of the start…not a bad thing 🙂 Finally it was happening. The national anthem. The introduction of the pro athletes. So given this was the first marathon under the Ciaccia administration instead of the Wittenberg administration, “New York City awaits you! The world awaits you!” was replaced with what we were all dying to hear: “Do we have clearance on the roadway? Lead vehicle are you ready?” Then the cannon. It was go time. New York, New York. That start never fails to get me. Every. single. time. Even though we were on the lower level of the bridge, it didn’t matter-I still felt like I was part of something amazing. Remembering everything I’d been told, and from my own previous experiences, I just took the first uphill mile carefully. Stayed in complete control, ran within myself, let whoever else go. “Run your race, keep your pace.” Was satisfied with that first mile, as well as what I made up on the downhill. One borough down, and pretty much right on the money with where I expected to be. Well as expected, mile 9 was a little crowded due to the 3 colors merging, but again, I figured that would help me keep things under control. Lafayette Avenue was a party as always! I was looking for a friend of mine who I knew would be cheering-I missed him (though I did see a few Whippets-THANKS, guys!) though he did see me-apparently I was “so focused and in the zone!” Made the turn onto Bedford and cruised through Williamsburg. Miles 10 and 11 were very familiar thanks to Metric and the Blue Line Run, and Mile 12 was a little bit of a homecoming, as back in the day I did many a track workout at the McCarren Park track, so I reminisced about those good times for a second. 🙂 Manhattan Avenue (love it…Manhattan in Brooklyn) was so festive! And before we knew it, we were making the turn onto McGuinness and the Pulaski Bridge, and the halfway point was in sight…wow already? It was almost like I floated through that second 10k in some kind of dream state-it was all going by so fast!! Hit the half-marathon point on the bridge in 1:38:38…time to check in with the goals. If I run even I’ll wind up with 3:17-smack dab in the middle of my range. If I lose my usual 2 minutes and change in the 2nd half (which I have been told is an even split for the NYCM course) I may just barely make it in under 3:20. But I actually felt I had a bit more left in me…let’s see how this plays out! Cresting the Pulaski, I looked to the left at the city skyline and got chills-that view just always takes my breath away. I’ll be seeing you soon, Manhattan! So given that in my first NYCM, someone knocked me down in Queens while going around one of the many turns, I just always want to make it through this borough staying vertical, and I did succeed in that 🙂 Made it through all the turns, saw one of my old Flyer teammates cheering like crazy, and oh hey hey Queensboro? Are we meeting already? Over the Willis Avenue Bridge and into da Bronx!! And checking in at the mile 20 point, seems I had sped up a bit…hmmm, could a negative split really be possible? Only one way to find out…I’m going for it! ….oh yes, the blue and yellow of the Whippets cheer station. Whatever I got during mile 18, you did it even better! 🙂 I was blowing kisses, waving, smiling…just in the moment and living it, revitalized by my dose of Whippets love. Now back to Manhattan, to finish what I started!! Now I was truly home. How many loops, how many workouts had I done here in the last 4 months? It was time. All or nothing. Give it everything, I’ve come too far not to. Cat Hill downhill was so welcome at that point, and was thrilled with my mile 25 split. 3:43 was ancient history. 3:20, that time I thought was so scary was gonna be smashed as well, now it was just a matter of where I was gonna wind up-and if was still gonna be a negative split. That last stretch on CPS…it was surreal. It was like it wasn’t even me running. I was watching some fast chick who looked like me, dressed like me, ran like me…my god, it was me. I heard my name being called by another one of my old teammates. I saw the 800 meters to go sign and knew I had it. This was it. After being on the struggle bus with running for about 3 years, and with marathoning for even longer, I was on the other side, and it was just a beautiful thing. That last turn into the park. That hill up to Tavern-I must have been so high that I mentally flattened it. Hit that finish line and put my arms up in celebration-oh hells yeah!!! Marathon redemption-done and DONE! Final time: 3:16:23-7:30 pace-shaving off an entire minute/mile from my Chicago 2010 time! Turned out I did get that negative split, as the second half was 1:37:45! Settled my unfinished business with the marathon distance and took back NYCM!! And oh yeah-that little race in April 2017? Well 5 years ago, I spent the better part of a year wondering if my BQ would be “DQed” (since after the 2011 registration fiasco, the standards were up in the air), and even then had to sweat it out in the “less than 5 minutes” group for a week. Now? I would get to register on the 1st day! So past the finish and walking it off. I high-fived another Whippet who finished just seconds ahead of me, and in the walk through the medals, finisher pics, heat sheets and whatever else, saw Brian and gave him a big congrats, as well as other Whippets and friends. Though I had to walk a little bit longer since I checked a bag, it actually wasn’t so bad-I knew I had to walk it off , shake it off and keep moving. Got my bag, got myself home, got myself cleaned up and got myself some Shake Shack eats before heading crosstown to rehydrate at the Whippets post party! Everyone was just celebratory, happy and buzzed…or maybe that was just me after making up for lost time 🙂 But all joking aside-was a great time, definitely enjoyed hearing everyone’s battle stories, regardless of if they ran or spectated! So I think nothing more needs to be said about my race, I think I pretty much made it clear how I felt about it. But it definitely gives me a newfound appreciation of what hard work and dedication can accomplish. And I will repeat something I said the weekend before the marathon…”Whatever happens next Sunday, you all helped in one way or another to really get me to enjoy the process again-and just that is priceless.” Running and I fell completely out of love in 2014. Whippets, you helped me love the sport again. In fear of leaving anybody out, I’m just going to say this. You all know who you are, and whether you shared a mile or a memory-or in some cases both!-with me in the last several months-can’t thank you all enough. Looking forward to many more miles and memories ahead-the best is definitely yet to come!